I’ve compiled these resources – videos, articles, and more – with teachers and parents in mind. They can be used in the classroom or at home to inspire the young heroes in your life. I invite all educators to order a free packet of materials for use in your classroom. These packets include posters, bookmarks, reader guides, and the T. A. Barron video collection. 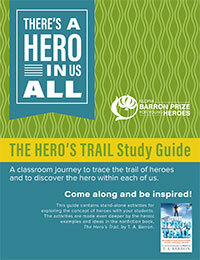 Also included in the packets are materials to help start conversations with students about the concept of heroes, including The Hero’s Trail study guide. I’ve also included some of the most relevant materials related to heroes available for download here, so you can get started using them in your classroom right away! Both the Dream Big documentary and T. A. Barron video collection (which includes several other videos on heroes) are available for download and to stream in your classroom. Check out this playlist of videos that I hope will help answer the question “What does it mean to be a hero?” The collection includes a video featuring Jane Goodall. And here are two videos about heroes made by students at a school in Ohio.